In the Details frame you can define the strings to be replaced. Strings can only be replaced in the appropriate database fields of the given database. In the drop-down list Fields you can select the following fields: Source_Text, Translation_Text, Categories, Customer. In the Replace textbox enter the text to be replaced, in the by textbox enter the new text. If the case is relevant for the text to be replaced tick the Case sensitive checkbox. There are two relace-by sections. Both are combined with AND operator when the search is executed. This means that you can do the search and replace securely for TUs without distorting the translation. Fore example if you need to replace "UN" by "United Nations" in the English source text and in the German translation "UN" by "Vereinte Nationen". You can do this in one action, if you define both replacements in one action. This way you can make sure that the replacement is only done for TUs where both the source text and the translation are affected. In the Restrictions frame you can set restrictions regarding the datasets selected for the replacement action. 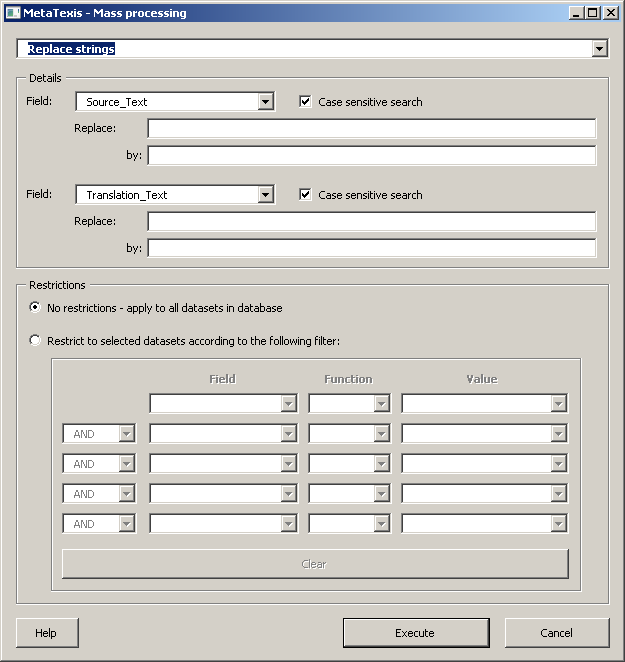 To define a restriction, activate the option Restrict to datasets according to the following filter, select a field, an operator and the restriction value in the related drop-down lists or text boxes. To execute the replacement action, click the Execute button.